OBJECTIVE: To determine the effectiveness of nuchal translucency (NT) screening in predicting aneuploidy and structural abnormalities in a South African population. SETTING: Chris Hani Baragwanath Hospital fetal medicine unit. OUTCOME MEASURES: An adjusted risk was derived from the combination of maternal age-related risk and the risk derived from NT screening. A positive screen was denoted by an adjusted risk of more than 1/300 and a negative screen by an adjusted risk of less than 1/300. In order to determine the number of undiagnosed abnormalities in the group, all babies were examined by a paediatrician at birth to detect and describe dysmorphic features. RESULTS: A total of 428 patients underwent first-trimester screening between July 2003 and July 2005. Three per cent were lost to follow-up. Of the 415 patients analysed, 59 screened positive and 356 screened negative. The mean age for both groups of patients was 30.1 years. Of the 57 patients who screened positive, 24 elected to have chorionic villus sampling (CVS). This resulted in the detection of 6 chromosomal abnormalities and 2 structural abnormalities. Among the remaining 356 patients, who had screened negative, 2 had an increase in the adjusted risk when the risk was compared with the background risk, and 1 chromosomal abnormality was detected in this group; 8 elected to have CVS because of a previous history of a chromosomal abnormality, and there were no abnormalities among them. CONCLUSIONS: The use of these screening methods has enabled prenatal karyotyping to become cost effective, and allows concentration on pregnancies at highest risk for chromosomal abnormalities, regardless of age. The use of first-trimester screening to detect chromosomal and structural abnormalities is well established.1-3 The first-trimester screening programme, which incorporates maternal age-derived background risk (a priori risk) together with nuchal translucency (NT) measurement, diagnosis of the presence of a nasal bone, and biochemical screening, was designed by the Fetal Medicine Foundation (FMF) in London, to calculate the 'adjusted risk'. It is used in many institutions in South Africa. However, data on its use in a predominantly black South African population are limited. Health care costs have risen above inflation over the last decade, with only marginal increments in the health budget, and as a result many first-trimester screening centres in Gauteng have been forced to omit biochemical screening. This descriptive study evaluates the use of a first-trimester screening programme without biochemical screening, in a predominantly black population. We retrospectively analysed the records of all the patients who underwent first-trimester NT measurement for the purpose of screening at the Chris Hani Baragwanath Hospital fetal medicine unit between July 2003 and July 2005. The study population comprised patients from the Chris Hani Baragwanath Hospital antenatal clinic, who had been referred to the fetal medicine unit for first-trimester screening. The patients were identified by performing a computer search of the fetal medicine unit database. The database software was provided by the FMF in England. The medical records of all eligible patients were retrieved and reviewed. There were no exclusions. Epidemiological variables retrieved from the medical records included maternal age, date of last normal menstrual period, previous chromosomal abnormality and ethnicity. Information derived from the ultrasound examination included fetal biometry and NT measurement. Abnormalities such as cranial defects, spinal defects, abdominal wall defects and limb anomalies were also recorded, as were the results of fetal karyotype analysis and the final outcome of pregnancy. In order to determine the number of undiagnosed abnormalities in the group, all the babies were examined at birth by a paediatrician to detect and describe dysmorphic features. In addition, babies who subsequently attended the paediatric clinics were reviewed and assessed to determine the incidence of late presentation and sequelae. The ultrasonographic scans were done on Medison Accuvix XQ and Siemens G50 machines by two doctors who were accredited by the FMF to perform first-trimester screening. The FMF criteria4 as listed below were used. a. Gestation should be limited to between 11 and 14 weeks. b. Crown-rump length should be limited to between 45 and 84 mm. c. The fetus should be examined in the midsagittal plane with the fetal neck in a neutral position. d. The magnification should be such that the fetus occupies at least three-quarters of the image and each increment in the distance between calipers should be only 0.1 mm. e. Care is taken to distinguish between fetal skin and amnion because at this stage of gestation both structures appear as thin membranes. f. The maximum thickness of the subcutaneous translucency between the skin and the soft tissue overlying the cervical spine should be measured by placing the calipers perpendicular to the fetal body axis, on the lines in an 'on to on' position (Fig. 1). g. During the scan three measurements are taken and the maximum recorded. The ultrasonographic findings of the 10 - 14-week scan, as well as the demographic data, were then entered into the software programme provided by the FMF and used to calculate the adjusted risk. A screen was considered to be positive if the adjusted risk was greater than 1:300 and negative if the risk was <1:300. In order to estimate cost the South African national health reference price list was used. The total cost of a first-trimester screen which included chorionic villus sampling (CVS) and genetic analysis was R2 426.70. The total cost of a genetic amniocentesis was R2 359.70. The results were analysed using Epi-Info 6.04 software and the p-value was set at <0.05 to determine statistical significance. For normally distributed data, the analysis of variance (ANOVA) was used and the mean and standard deviation were recorded. The Kruskal Wallis test was used for non-parametric data and the median and range were recorded. All patients for whom the outcome of the pregnancy was not available were excluded from sub-analyses. The study was commenced after approval had been obtained from the Human Research Ethics Committee of the University of the Witwatersrand (protocol number M041108). A total of 428 patients underwent first-trimester screening during this period. Thirteen patients (3%) were lost to follow-up and were excluded from sub-analysis. Of the 415 cases that were analysed, 59 patients screened positive and 356 negative. Black patients comprised 78% of the total, with 14% coloured, 6% white and 2% Indian. This conforms to the racial distribution in South Africa as a whole. Twenty-six per cent of women were older than 35 years. The results in Table I show that there was no significant difference between the mean ages of women who screened positive and those who screened negative. Only 46% of women in the screen-negative group and 23% of women in the screen-positive group could recall the date of their last normal menstrual period. An explanation for the difference could not be found. The crown-rump length measurements of fetuses of women who screened positive were significantly shorter than fetuses of women for whom a negative screen result was obtained. This finding may have been due to early onset of intrauterine growth restriction. Table II summarises the outcomes of screened patients in whom CVS was performed and in those who elected not to have the procedure. Of the 59 patients who screened positive, 24 elected to have CVS. This resulted in the detection of 5 chromosomal abnormalities (2 trisomy 21, 1 trisomy 13, 1 trisomy 18, 1 Turner's syndrome) and 1 single-gene defect (Tay-Sachs disease). In addition to the CVS, the anatomical survey detected 2 fetuses with acrania, 2 with multi-structural abnormalities, and 4 with multi-structural abnormalities that were characteristic of trisomy 13, trisomy 18, trisomy 21 and Turner's syndrome, respectively. The patient who was suspected to be carrying a trisomy 21 fetus elected not to have CVS, and decided to continue with the pregnancy. The remaining 12 patients in whom abnormalities were detected elected to have their pregnancies terminated. There were 6 intrauterine fetal deaths in the remaining 46 patients who had screened positive; 5 were due to pre-eclampsia and 1 was related to warfarin-induced hydrocephalus. Of the 356 patients who screened negative, 2 had an increase in the adjusted risk when the risk was compared with the background risk. Both were offered CVS. One elected to have CVS and a trisomy 18 fetus was diagnosed. This patient elected to have a termination of pregnancy. The remaining patient gave birth to a baby with no phenotypic abnormalities. The reasons for CVS in the remaining 8 patients included a previous abnormal fetus, advanced maternal age, a history of recurrent miscarriages, and (in 1 case) confirmation of paternity. The karyotype of all these fetuses was normal. In this group, there was 1 post-procedural pregnancy loss. The 6 intrauterine fetal deaths were related to maternal complications such as eclampsia, abruptio placentae and over-warfarinisation. The 2 fresh stillbirths were caused by maternal hypertensive complications that necessitated preterm delivery. Table III illustrates that male fetuses had a significantly higher rate of false-positive screens as well as a higher frequency of chromosomal or structural abnormalities. Five patients with twin pregnancies underwent first-trimester NT screening, and no fetuses with aneuploidy were found (Table IV). The mean NT measurement was higher in monochorionic than in dichorionic twin pregnancies. 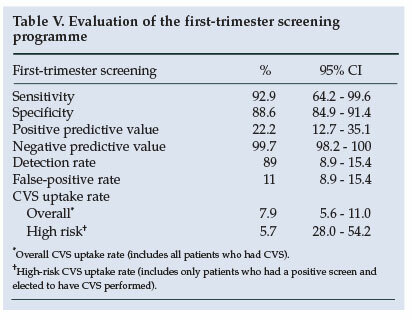 Table V confirms that the first-trimester screening programme was effective in terms of achieving a high sensitivity, specificity and positive predictive value. However, the false-positive rate was unacceptably high. Table VI compares the actual cost of the first-trimester screening programme at Chris Hani Baragwanath Hospital with the hypothetical cost of a second-trimester screening programme in the same group of patients. If amniocentesis had been performed in all 108 patients in the second trimester, only 50% of the fetuses with trisomy 21 would have been detected. The remaining 50% would have occurred in those aged under 35 years. The actual cost of the first-trimester screening programme amounted to 29% of the cost that would have been incurred by a second-trimester screening programme, and 100% of trisomy 21 fetuses were diagnosed. If strict protocols had been implemented and CVS had been performed in only high-risk patients with a risk cut-off of 1:300 or more, the cost incurred would have been only 21% of that for a second-trimester screening programme. The a priori risk determined by a maternal age of over 34 years was previously the sole criterion used to delineate women at high risk of having a fetus with a congenital abnormality, especially trisomy 21. It stands to reason, however, that a woman's risk of having an abnormal fetus does not increase substantially the day she turns 35 in comparison with her risk on the eve of her 35th birthday. The fact that there is no statistical difference between the mean ages of women who screened positive and women who screened negative (Table I) supports this interpretation. The NT measurement usually increases with gestational age.5 The precise ascertainment of gestational age is important in order to achieve an accurate NT screen. The majority of women in this study were inaccurate in their recall of their last normal menstrual period. A first-trimester ultrasound examination would therefore also promote accurate dating of the pregnancy. However, the benefit of early ultrasonographic dating may be negated if there is early-onset intrauterine growth restriction. The patient in whom a fetus with Tay-Sachs disease was diagnosed (Table II) had screened positive, and although there is no current literature to support the diagnosis of a single-gene defect by NT assessment, the positive result may have been related to the genetic defect. Of the 356 patients who screened negative (Table II), 2 had an increase in their adjusted risk when it was compared with their a priori risk. When these women received counselling they were told that their risk of having a congenitally abnormal fetus was higher than their a priori risk had suggested, and one of them elected to have CVS when offered. A diagnosis of trisomy 18 was made in that fetus. The remaining patient gave birth to a baby with no phenotypic abnormalities. While the cut-off limit for CVS had been set at a risk level of 1:300,1 when counselling a patient it is difficult to reassure her that the adjusted risk, though increased, is 'acceptable'. Respect for autonomy is a central principle in ethics and in law.6 It is not uncommon for women to decline an invasive procedure even if a first-trimester screen indicates that there is an increased risk of aneuploidy, and this decision must be respected. By the same token, some women find even a minimal increase in the adjusted risk unacceptable. The finding that male fetuses had a greater frequency of false-positive screens (Table III) suggests that male fetuses may have a larger NT measurement than female fetuses. There are no data supporting this theory, and it certainly merits further investigation. There were no aneuploid fetuses among the twin pregnancies, and the mean NT in monochorionic twins was significantly higher than that in dichorionic twins. These data are similar to findings in previous studies.9 Sebire et al.10reported a 1.5 times greater NT in monochorionic twins than in dichorionic twins, and this finding was attributed to an early onset of twin-to-twin transfusion syndrome. The Chris Hani Baragwanath hospital first-trimester screening programme to detect structural and chromosomal abnormalities was found to have a sensitivity of 92.9% and a specificity of 88.6%. These results compare favorably with the findings of Snijders et al.,1 who achieved a sensitivity of 82% for a false-positive rate of 8.3% when first-trimester screening for trisomy 21 was implemented without biochemical screening. The benefit of a reduced procedure rate in the setting of a high incidence of HIV seropositivity lends additional benefit to the implementation of a first-trimester screening programme. In a country like South Africa, where budget limitations dictate the quality of medical services provided, the Chris Hani Baragwanath Hospital first-trimester screening programme has been shown to be cost effective with an efficacy equivalent to international standards. The cost and benefit in terms of man-hours required to implement the programme in the general population will need to be assessed. The authors thank Sister Patricia Sibanyoni for her excellent medical record keeping.